Mark Patrick Flaherty announces he is running for Allegheny County Controller, challenging fellow Democrat Chelsa Wagner who currently holds the post. Flaherty was Controller from 2004 to 2011. Former Allegheny County Controller Mark Patrick Flaherty has announced his candidacy for the post currently held by Democrat Chelsa Wagner. Flaherty, who held the post from 2004 to 2011, will seek the Democratic nomination. “I really enjoyed it. 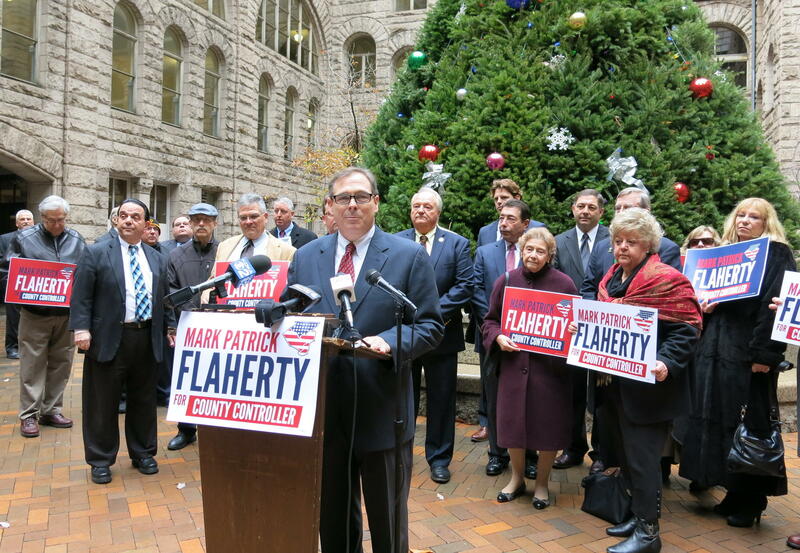 I’m looking forward to getting back and helping people and meeting a lot of people out there on the campaign trail and seeing what ideas and what suggestions they might have to improve efficiencies of county and all governments in Allegheny County,” said Flaherty. “I believe that I can restore the respect and confidence needed in the office of county controller, to do an effective job,” he said. Wagner issued the following statement about Flaherty’s running. “County residents understand the importance of an independent controller,” said Wagner, “as the fiscal watchdog for taxpayers. I'm proud to run for re-election on a record that has brought checks and balances to county government at a time when it is critically important. Voters want and deserve a controller that works for and answers to them, not someone who is running at the direction of the county executive, and answers to him." Wagner and Fitzgerald have publicly butted heads. Still, when asked if he is supporting Flaherty, Fitzgerald didn’t give a yes or no. Flaherty said he was tough but fair as county controller and said he would be an independent voice. “When you go in to audit departments and other areas of government you have to call it like you see it, but you also have to gain respect and confidence and I think that’s what’s been eroded, and that’s what’s important to restore in the next term as controller,” he said. Wagner announced her re-election earlier this month. Despite rumors that she was setting her sights on the County Executive’s office, Allegheny County Controller Chelsa Wagner will be officially launching her campaign for a second term at an event Monday night.